Female suicide bombers in Nigeria are now carrying babies to avoid detection in their attacks, authorities warn. An attack in the town of Madagali on 13 January saw two women detonate their devices, killing themselves, two babies, and four others. They had passed a vigilante checkpoint, mistaken for civilians because they were carrying infants. Female attackers have been seen before, but officials said the use of babies could signal a "dangerous" trend. The insurgent group Boko Haram is widely suspected of having carried out the attack. Four women attacked Madagali located in Adamawa State, which was recaptured from Boko Haram in 2015. Two were stopped at a security checkpoint, and detonated their devices, officials said. The two women carrying infants, however, were not stopped, and exploded their own devices past the security point. 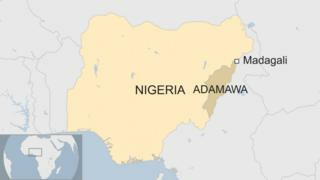 The Nigerian government has been fighting the group in a major counter-offensive, recapturing much of their former territory. But the insurgents have ramped up their suicide bombings in response. In early December, two female suicide attackers killed at least 45 people in the same town, after they detonated their devices in a busy market. A similar attack killed 25 people a year earlier.